"Black Bart" was born John Roberts in 1682 in Wales. Only after his death was he commonly known as Black Bart. In his short, 30-month career, Roberts became one of the most successful pirates during the golden age of piracy in the Caribbean. It is estimated that Roberts and his fleet captured over 470 vessels and millions in gold, gems, and other riches. While working on a ship that was captured, Roberts came to the attention of the captain of the victorious ship for his abilities as a navigator. A short while later, the captain of the ship was killed and Roberts was voted in as the new captain by the crew. One of his first successes was against a fleet of Portugese ships that carried a magnificent treasure of gold and gems designed for the king of Portugal. Roberts captured many ships and prisoners and killed many pirates during his reign on the seas. He was not as cruel to some prisoners as some pirates, but his reputation for torturing and killing captives was widely known. With each victory, his fleet and success continued to grow. Roberts attacked ships of all nations, but singled out France and its colonies. In a battle near Cape Lopez in Gabon, Black Bart was killed. Before the opposing ship's captain could capture his body, Roberts' crew buried him at sea. Black Bart's trademark was his boldness. He was known for being well-dressed and outspoken. With a fondness for fine clothes, he led his crews into battle wearing a number of pistols tucked into a silk bandolier with a diamond cross hanging around his neck. 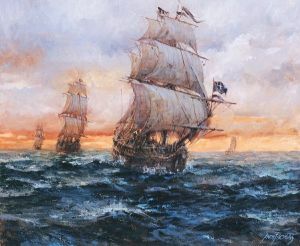 In spite of the terror Roberts wreaked on the high seas, he was a man who did not drink, encouraged prayer by his crew, and did not allow them to drink or gamble. Roberts was a gifted leader of men and held his crews together using prize money, codes of conduct, and, above all, constant success.